This article is part of an ongoing series spotlighting Hope South Florida, a unique collaboration of city officials, social agencies and the faith community with a single purpose – to end family homelessness in Broward County. A father moves to correct his 12 year old son’s spelling. He fears the day when his son’s questions will outpace his knowledge even as he dreams of his being the first to walk across the stage to receive a high school diploma. The question seems simple enough. 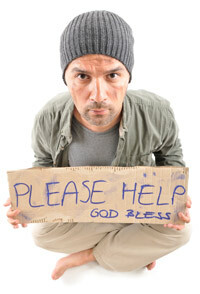 Choose the description of the person you recognize as homeless. Did you choose the man with the voice? The mother with the concern for her child? Perhaps the father with fears of the future? Did you choose all of them? If you are part of the congregation at First Presbyterian of Fort Lauderdale, your chances of choosing correctly were probably significantly heightened. After years of being involved in homeless Life, members of the congregation have seen for themselves that the face of homelessness in their community is the face of a father sitting in a public library trying to help his son. After he lost his job, the library is the only place open to them with lights. They’ll spend the night outside wherever they can find some temporary shelter. It’s the face of a mother who doesn’t tuck her daughter into a princess bed at night but into the back seat of the car parked at the area big box store. The mother’s sleep will be fitful as she is constantly vigilant in fear that someone will approach the car while they are sleeping. Pat confirms that the resemblance to hosting guests in our own homes is intentional. “We ask the church’s volunteer coordinator to arrange for a shared dinner at the church. This becomes a wonderful time where the volunteers are able to welcome the clients to their home. It may be the house of God but there is a true spirit of hospitality. It is a time of fellowship – often with games for the children and a chance for the adults to get to know each other. The coordinator has arranged for two or three parishioners to stay overnight in case a need arises during the evening,” Pat adds. Tim Dobbins is enthusiastic about the changes that serving as a host church has produced, not just within the families First Presbyterian has helped but also within the hearts of the congregation. “I think that it has been so important for our people to realize that not 100% of the homeless are the ones on the street corner- all the people that we are referred are families. These are mothers and their children and our folks just fall in love with them. It’s our chance to recognize that behind the tag of homeless are people with dreams, hopes and fears just like us all who have found themselves in a stressful position. If we who are maybe a step or two farther along in terms of resources can help by providing a few nights where they don’t have to fear someone knocking on their car window as they sleep, it’s a good thing,” shares Tom. Each year, the Faith In Action program serves almost one hundred families by providing an average of two weeks of shelter. That works out to over 5,500 nights of shelter, a credit to the number of faith organizations that are involved and committed to providing a welcome to the homeless in the house of God until they are able to transition into mainstream homeless shelter programs. 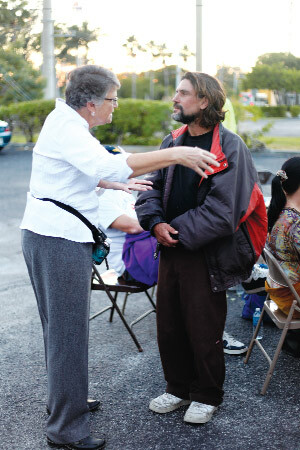 For more information on how you or your congregation can be a part of ending family homelessness in Broward County, call Hope South Florida at 954-566-2311 or visit: www.HopeSouthFlorida.org.